This 16" Real Clean Industrial and Commercial Microfiber Mop is made of lightweight aluminum. We include (1) 16" Microfiber Wet Mop Pad, (1) 16" Microfiber Dust Mop Pad, (1) 70" Durable and Lightweight Telescopic Aluminum Handle and (1) Heavy Duty 16" Aluminum Mop Frame. 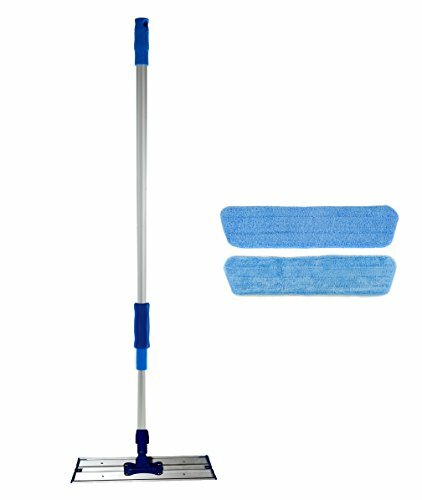 The Microfiber Wet Mop pad makes cleaning floors so easy and rewarding. The Microfiber Dust Pad cleans dust, pet hair, dirt, crumbs and anything else that hits your floors. Just run it across the floor and watch the dirt stick to the Microfiber Dust Mop Head. Cleans in seconds! Both Microfiber pads are made exclusively in Korea from a higher quality microfiber. The Heavy Duty Trapezoid Aluminum Mop frame is great for getting into every corner of your house. The telescoping mop pole extends to a full 70". Utilized with Microfiber pads they form the latest in mopping technology. This allows for a more efficient and productive system. These Mops are now being utilized in schools, hospitals, restaurants, and senior living homes around the world. In the health care industry Microfiber mops and pads are used in patient rooms to reduce the risk of cross contamination from room to room. Each Microfiber Mop pad contains hundreds of thousands of porous microscopic fibers that remove bacteria from floors and other room surfaces. Microfiber Mop pads are attached to a Velcro strip on the bottom of the mop head making for a simple and safe system. The amount of dust, bacteria and germs you remove will be drastic and amazing. Just throw them in the wash when you are done and you are ready for use after use! This will change the way you clean your surroundings. 16" Microfiber mop pads are washable and reusable over and over. If you have any questions about this product by Real Clean, contact us by completing and submitting the form below. If you are looking for a specif part number, please include it with your message.